I have long been meaning to watch this Raj Khosla film again. I saw it a few years ago but remembered little about it except one Sadhana dance which is spectacular: “Jhumka Gira Re Bareilly Ki Bazaar Mein” and a vague feeling that it was pretty good. And it is pretty good—really good in fact! I was riveted and (thanks to my dismal memory) not completely sure I had the mystery figured out until the very end. 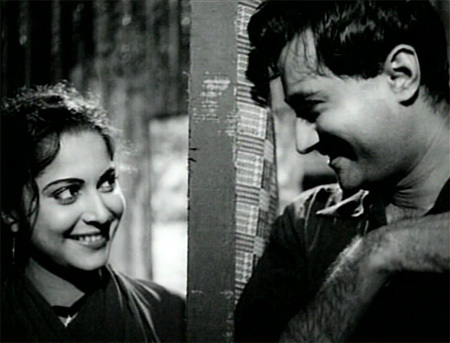 The performances from Sunil Dutt and Sadhana are wonderful, and the competently plotted story moves along briskly with tension building ever so gradually: the direction and editing are masterful. It’s also beautifully photographed and just chock-full of pretty, especially the locations in Udaipur (and Sunil and Sadhana!). Any quibbles I have are minor: the end is a bit flat after the marvellous buildup, and I got tired of the title song after the umpteenth time hearing it—pretty as it is—but that’s about it. 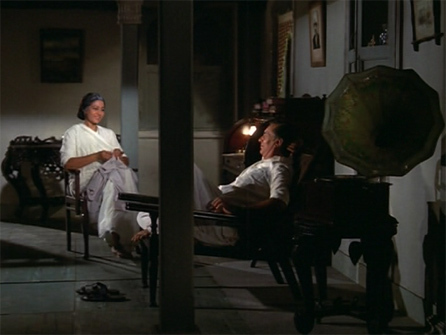 Frank Capra’s It Happened One Night has inspired more than a few Hindi remakes, three of which I’ve seen: Raj Kapoor’s Chori Chori, Shammi’s Basant, Aamir Khan’s Dil Hai Ke Manta Nahin. This one is now my favorite by far. The camera work and lighting is as lushly beautiful as Guru Dutt’s pictures always were; there’s no need for any color here! Add the sheer gorgeousness of (and chemistry between! and performances by!) Waheeda Rehman and Dev Anand, SD Burman’s sublime songs, and Raj Khosla’s brisk direction and it’s a classic (I like it even better than Capra’s original, and that is saying something). Sometimes even a viewer with no clue about filmmaking (that would be me) can sense when the director (in this case, Raj Khosla) is a good one. Such is the case with this film, which has a fairly unremarkable story (until the end, when it plunges into irritatingly stupid) and pleasant but dull music (Madan Mohan). But the romantic chemistry between the lead pair alongside the interesting camera work and the brisk pace keeps everything going, which kept me going too. 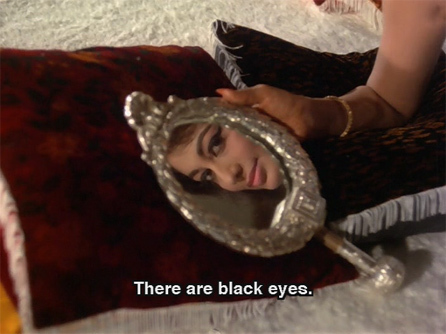 The sometimes hilarious subtitles helped, although I doubt that Raj Khosla had anything to do with those. I should also say that Asha Parekh looked absolutely gorgeous in this film, and I think our director thought so too, because there are a lot of lingering closeups of our heroine! When I found this DVD I was puzzled as to how it had not registered before on my radar: Raj Khosla directed, Salim-Javed wrote the dialogues, and it stars Amitabh Bachchan, Shatrughan Sinha, Zeenat Aman, Prem Chopra, Amrish Puri, Helen AND PRAN along with a serious array of character actors (KN Singh, Iftekhar, Sudhir, MacMohan, Birbal, Paintal, Trilok Kapoor, Jagdish Raj and more!). How could that possibly go wrong? And it didn’t, really, at least not terribly…but it is dull and predictable; and there is no chemistry whatsoever between Zeenat and AB or SS, or—more importantly, actually—between AB and SS. It is also a little sloppy at times: Pran has a young son who doesn’t age at all, for instance, although Pran himself does (going from dark hair in a flashback to completely gray hair in the present), and Prem Chopra fires a number of bullets from a gun inside his pocket—but somehow said pocket remains intact, without holes. These are just minor issues though, and if the story had been better, with actors not just going through the motions, they would hardly warrant a mention (at least from me). Raj Khosla’s first venture into directing is a solid entertainer, although apparently it failed at the box office. The quality of the DVD was lacking, probably due to the source material—it was by turns really dark, overexposed or blurry, and there were definitely some scenes missing, but nonetheless it kept me in my seat! I love that Khosla populates his films with strong and believable female characters, and this is no exception. Lovely and talented Geeta Bali is the heart and soul of this movie, but she’s very ably supported by Dev Anand minus most of his mannerisms, and Memsaab favorite KN Singh as an unscrupulous (but suave and sophisticated, natch!) lawyer. Khosla assisted Guru Dutt (another Memsaab favorite) and his influence is seen here too—beautifully shot songs, atmospheric use of light and dark (although hampered a bit by time’s wear and tear). 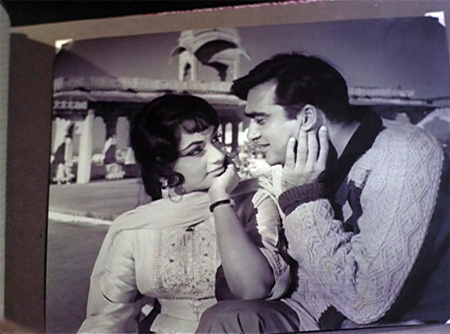 And Khosla’s habit of “framing” his shots is here too, although not as sophisticated as in his later films. Raj Khosla is one of my favorite directors. But man, this movie is a waste of time. It’s chock full of red herrings that never lead anywhere (and are never explained), along with clues which are so manifestly obvious that you feel clubbed over the head with them. Plus, it’s boring, with an ending so convenient and contrived that there’s no payoff for sitting through it at all. I don’t know if my dislike of Manoj Kumar contributed to my dislike of this film, but I do know that his presence didn’t help it any. The only bright spot really was Helen, and she was bumped off pretty early on. Sadhana looked gorgeous, but she appeared to be as bored as I was. With a title screen (and title) like this, you’d expect a happy movie, right? Wrong! It’s incredibly sad. I sobbed for a good hour. But it’s also really good. The story takes place against the backdrop of India’s fight for freedom from British rule (although no attempt to recreate the period through costumes or anything has been made), and is a love triangle between two best friends and the girl they both love. What saves it from descending into jingoism and melodrama are the marvelous performances by Shashi Kapoor, Rajesh Khanna, Mumtaz and Vinod Khanna; Raj Khosla’s deft direction; and the lovely songs by Laxmikant Pyarelal with beautiful, meaningful lyrics by Anand Bakshi. This is a pretty long post, because there’s a lot to say about this film. It isn’t perfect, but does so much just right that the imperfections don’t matter. Feeling thwarted by my truncated Phaansi experience, I embarked on another dacoit saga. These films have the added bonus (for me) of engaging Gemma’s attention too (the horses); she goes absolutely nuts which is entertaining by itself. It also makes her very pleased with herself, and how can that be bad? She’s defending me against those big bad animals! Plus, this movie is directed by Raj Khosla—one of my favorite directors—and it stars Vinod Khanna and Kabir Bedi as deadly adversaries who find redemption through their love for the same girl (the absolutely stunning Moushumi Chatterjee). 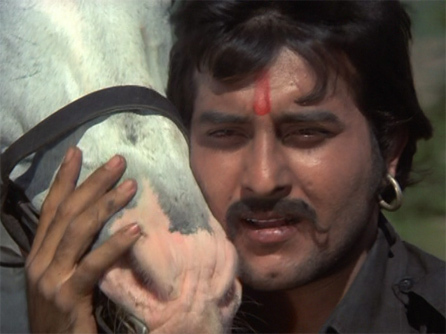 One more thing about the horses: Vinod’s is a white one named Dara, and Kabir’s is a black one named Toofan. Heh. I love films that give insight into the issues and concerns of the time during which it was made. This is one of them, where a family is ripped apart when its members are caught between old traditions and burgeoning foreign influences. 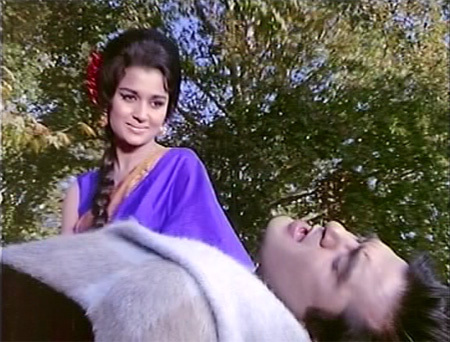 Although Rajesh Khanna and Mumtaz are nominally the hero and heroine, the film really belongs to the whole ensemble cast. Above all, Balraj Sahni shows why he is considered one of the great actors in Hindi cinema and Veena shines as the family matriarch. Anita might be a good film. The only thing is: the SUBTITLES! SUCKED!! They came on five-ten seconds after the dialogue or scene had ended; sometimes flashed so briefly that there was no way to read them; and very often there were large gaps where single words would just show up occasionally. Because the story was fairly complex (a murder/suicide/reincarnation/multiple personality/ghost story) I had a headache in no time. And I became distracted by mostly irrelevant details (as you will see). Luckily there were plenty of irrelevant details to entertain, but still. As I said—I think properly understood, this might be a good film. I wish I knew for sure. The music is certainly delightful!